In a previous post, I talked about a A Simple C++ Project Structure that I am using to create a bunch of high-speed daemons for work. It’s been fun using TextMate 2 and a Terminal to make and run the project, but now that I am getting to the meat of the coding, I’d prefer to use an IDE to help me navigate and debug the code. 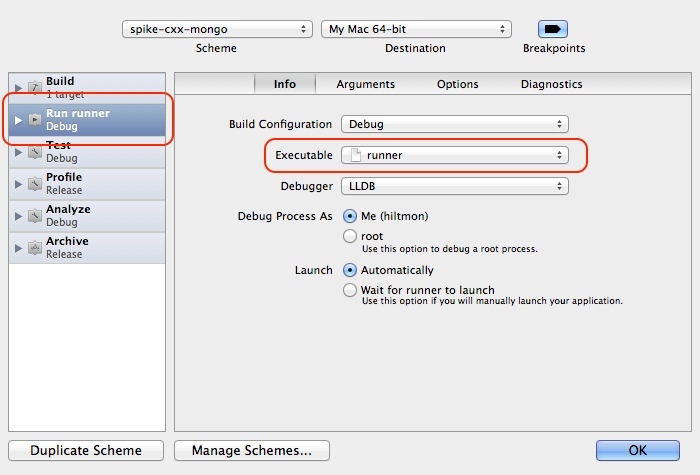 Here’s how to set up Xcode 4 on the Mac to compile using our Makefile and run/debug the application. Note that since these projects already exist, there is a minor shenanigan involved in setup. Start Xcode and choose File / New Project. Click on Other then choose External Build System. 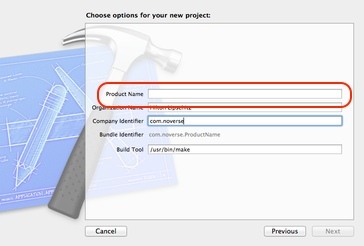 Input your project name, I use the existing project’s name so that the Xcode project file matches. Now you will save this project at the root of the Simple C++ project folder. Just select the project root and hit Create. The problem is this. If you has chosen the root of your Projects folder where the Simple C++ project resides, Xcode would have replace the simple project folder with a blank folder and its *.xcodeproj file. That’s not what we want. So instead, we chose the root of the project itself. But Xcode has created a subfolder named after your project and placed the *.xcodeproj file in that. That’s not what we want either. So lets fix it up. Drag the *.xcodeproj from the subfolder and drop it on the project root. Now delete the subfolder. Double-click the moved *.xcodeproj to open the project again in Xcode. 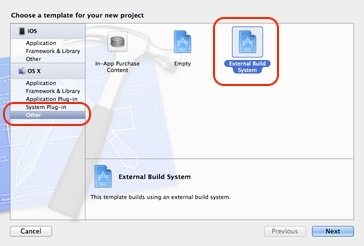 At the bottom left of the Xcode window, click the + icon. Then choose Add files to “Your Project Name”. Select everything except the build folder and choose Add. Click on the project at the top to see the Project and Targets panel. You should see an External Build Tool Configuration already setup to use the Makefile we had before. We still need to do one more thing and that is to tell Xcode which executable to run. Under the Product menu, choose Scheme then Edit Scheme.. or press ⌘<. Click on Run in the left pane. The click on the drop-down next to Executable and choose Other…. Find the executable in the bin folder and click on it. If you prefer, you can change the debugger to GDB as well. To pass arguments to the default run, click the arguments tab and add them there. Press ⌘R to run, and Xcode will bring up a console window to display the program’s output. If you press ⇧⌘K (or choose Product / Clean), Xcode will run the clean target in the Makefile. The Xcode organizer imports and loads the git source code control environment so you can branch and commit from Xcode. You get a really nice GUI debugging environment (which was the real goal). Also, don’t forget to commit these changes when done. Now we have a Simple C++ Project that can and will compile under Linux using command-line tools, and a GUI IDE environment to develop and test it on the Mac.